“psyKo” is the nickname of the Swiss National Congress for Psychology Students. It is happening next weekend and the nice thing about it is that I’ll be presenting there! My first conference presentation, yay. There are 2 main topics in my lecture: how ostracism appears not to affect effort mobilisation, and how age can influence people’s susceptibility to being excluded. My ‘Student Lecture’ has a not-very-good title, and I’m not sure that the content will be the greatest either (what with my experiment being a “failed” one). Nevertheless, I’m still excited and, however it may go, will add this experience to my CV, hehe. This entry was posted in My Research Experience and tagged presentation, Psychology on March 19, 2014 by Ria Pi. If I cared enough, I’d give some reasons for my cyber-absence these past times, but I know better than you to bore people with such soporific details. Instead, I’ll publicly display the mid-version (between the early and the final version) of the introduction for ‘Exploring the Effects of Ostracism on Effort Mobilisation’ – the pilot research project I conducted for my undergrad degree in psychology. Social inclusion and acceptance from others seems to be a pervasive characteristic of social species. It is so important that the increase in social complexity is thought by some to have driven the evolution of higher cognitive abilities in human and non-human animals (Bugnyar, 2013; Herman, 2010; MacLean et al. 2012; Marino, 2002). Despite its benefits (e.g., emotional support, social learning, cooperation), social connectedness is not always attainable because others always have the possibility to reject a target (Pickett & Gardner, 2005). Ostracism is defined as the act of being excluded and ignored (Williams, 2007a). It is exhibited in several species in which it can serve as a regulatory mechanism in social interactions (Goodall, 1986 as cited by Williams, Cheung, & Choi, 2000; Lancaster, 1986). In humans, ostracism has been witnessed in social groups of various sizes and types, across time and cultures, making it a ubiquitous experience (Williams et al. 2000; Williams, 2007b). Because of its deleterious consequences on the human psyche, it is a very powerful experience too. Indeed, being ostracised is never pleasant. For illustrative purposes, imagine that you are in school. The teacher asks everyone in the class to pair up for an assignment. However, the odd number of students leads you to be partner-less. According to the temporal need-threat model of ostracism (Williams, 2007b; Williams & Nida, 2011), there is a good chance that you will start by experiencing social pain, regardless of any other factor. Described as a “reflexive” distress response, it is actually similar to physical pain in that both share the same neural and anatomical basis (Eisenberger, Lieberman & Williams, 2003). Following will be negative affects – emotions such as sadness and anger, and worsened mood, as well as thwarted fundamental needs for belonging, self-esteem, control and meaningful existence. Ostracism hurts even when it is set to be financially rewarding while inclusion is costly (van Beest & Williams, 2006). Moreover, ostracism affects people as much when it is accomplished by a despised outgroup (i.e., the Ku Klux Klan) as when it is accomplished by a rival outgroup or an ingroup (Gonsalkorale & Williams, 2007). Zadro, Williams and Richardson (2004) found that ostracisers don’t need to be living human to impact the target – explicitly computer-generated ones can too. After cognitive appraisals of the situation’s bearing and depending on the needs that were the most threatened, you may go on to enact strategies to restore them (Williams, 2007a). To do so, you may select one of two main paths – restoring social inclusion or control and meaningful existence (Williams & Nida, 2011). The former path involves conducts aimed at bringing about amicable responses from others, whereas the latter entails antisocial behaviours providing a sense power and control over the social situation. Lustenberger and Jagacinski (2010) theorised that ostracism might also influence people’s ability to experience intrinsic motivation (i.e., the “tendency to seek out novelty and challenges, to extend and exercise one’s capacities, to explore, and to learn”; Ryan & Deci, 2000) for a subsequent task. They found that, after having controlled for initial interest, ostracism led to reduced levels of positive mood that, in turn, caused lower self-reported levels of intrinsic motivation. This indirect effect of ostracism on people’s ability to perceive a task as valuable and enjoyable shows how it might play a role in the development of personal preferences and long-term work satisfaction. In fact, prolonged periods of social exclusion are known to diminish people’s coping resources, anxiety, poor self-esteem and depression (Pickett & Gardner, 2005; Williams & Nida, 2011). In organisations, it worsens performance and leads to more negative job attitudes (Lustenberger, 2011). According the theory of motivation intensity (Brehm & Self, 1989), two major factors influence the amount of effort one makes during instrumental behaviours, which are behaviours that result, upon successful completion, in a designated outcome. The first one is potential motivation, defined by Brehm and Self (1989) as the amount of effort one is willing to put in, which differs from the amount of effort one actually makes (Wright, 1996; Wright, 2008). Take for example Charlie – a student about to take an exam. Although the exam might be so important to him that he would be willing to spend 10 hours studying for it (high potential motivation), he only spends 2 hours – the minimum amount of time proven to be necessary to succeed in it. The second factor is task difficulty – people should spend more effort with increasing fixed levels of difficulty (Brehm & Self, 1989; Light & Obrist, 1983; Richter, Friedrich, & Gendolla, 2008; Wright, 1996; Wright 2008). Although assuming that effort, like money or petrol, is a resource that should be spent conservatively, people should exert it only as long as success is perceived as attainable. If Charlie had only 1 hour available to study (insufficient to fair well in the exam), he would know that the probability of his success was negligible and would therefore not have worked much. When combined, these two factors bring about a specific pattern of effort mobilisation (see Figure 1). 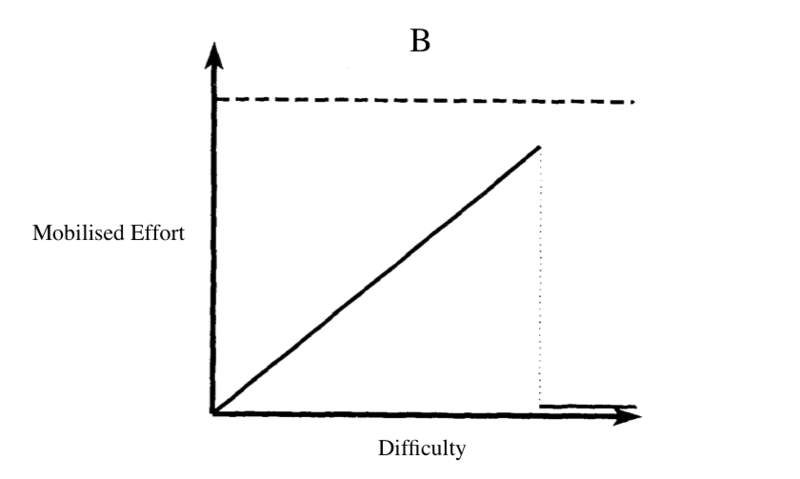 It rises linearly with difficulty until either the person is not willing to do any more (Figure 1B) or the task is perceived as impossible or the outcome is otherwise inaccessible (Figure 1B). Figure 1. 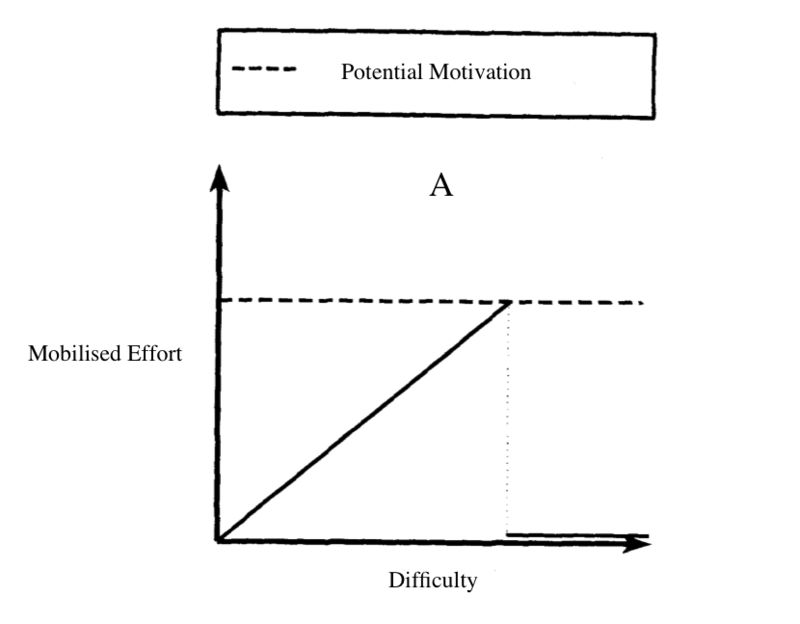 Effort mobilisation as a product of difficulty and potential motivation (adapted from Wright, 1996). Variables such as need, incentive value of the outcome, outcome attainment (the probability that a goal will be satisfied upon successful execution of a task; e.g., Wright, 2008), and mood (Gendolla & Brinkmann, 2005) have been found to directly determine potential motivation’s higher limit, meaning they indirectly influence the intensity of effort mobilisation (Wright, 1996). In this study, it was hypothesised that, because of its negative impacts on a person’s affective state, ostracism may influence potential motivation too. By augmenting negative mood (Gonsalkorale & Williams, 2007), decreasing positive mood (Gonsalkorale & Williams, 2007; Lustenberger & Jagacinski, 2010), producing less positive and more negative emotions (van Beest & Williams, 2006), and hindering the ability to feel intrinsically motivated by a task (Lustenberger & Jagacinski, 2010), ostracism might contribute to lowering potential motivation. Presuming it does, the pattern of effort mobilisation across difficulty levels should vary with the inclusionary status. When the task is easy, ostracised people should be able to mobilise as much effort as included ones (Figure 1A). When it is difficult, only included people should continue to mobilise effort while ostracised ones should disengage (Figure 1B). To investigate the effects of ostracism, the inclusionary status needs to be manipulated in a manner that creates experiences of either inclusion or ostracism. Using Cyberball (Williams & Jarvis, 2006), a virtual ball-tossing game program, it is possible to manipulate the degree of inclusion by modifying the number of throw a participant receives. Coupled with two contrasted levels of difficulty, this generated four conditions: inclusion-easy, inclusion-difficult, ostracism-easy and ostracism-difficult. Research in psychophysiology has shown that the intensity of effort in active coping correlates with measures of cardiac sympathetic activity, especially systolic blood pressure (SBP) and pre-ejection period (PEP) since they consistently underlie cardiovascular reactivity (Annis, Wright, & Williams, 2001; Light, 1981; Obrist, 1980 as cited by Richter et al. 2008; Schächinger, Weinbacher, Kiss, Ritz, & Langewitz, 2001; Wright, 1996). Specifically, SBP should increase and PEP decrease in response to higher amounts of effort being exerted. This provides a sound way to operationalize effort mobilisation. Changes in cardiac reactivity measures should exhibit the same theoretical interactional patterns that are depicted in Figure 1. Namely, it was predicted that (1) in the inclusion conditions, cardiovascular reactivity would increase with difficulty whereas (2) in the ostracism conditions, it would drop between the easy and the difficult condition because of task disengagement. As always, any feedback is welcome, but I’ll be over the moon even if a half a person reads the first sentence! This entry was posted in My Research Experience and tagged Motivation, Ostracism, Paper, Psychology, Social exclusion on June 6, 2013 by Ria Pi.